Original grave site of 2253 Lance Corporal of Leichhardt, NSW, and 4537 Private Stanley Witcombe, of Mosman, NSW. Both of the 20th Battalion, they were both killed in action on 25 February 1917 and are buried at the Warlencourt British Cemetery, France. (Original stored in Archive Store). 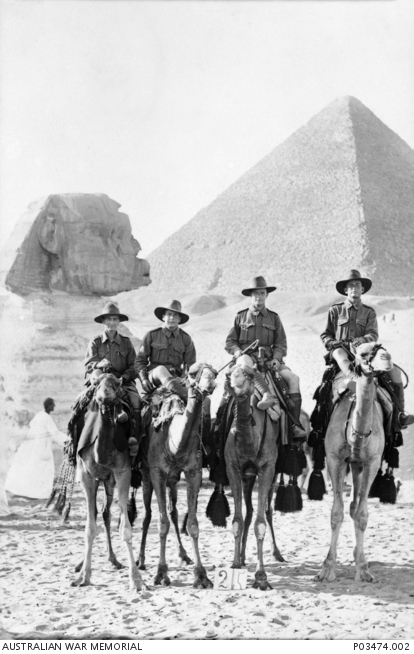 Group portrait of four soldiers on camels in front of the Sphinx and a pyramid. From left to right: 2254 Private Sydney Malcolm Flannery, 20th Battalion, of Dulwich Hill, NSW; 2253 Lance Corporal (L/Cpl) Alexander Cullen,of Leichhardt, NSW; 2252 Corporal David Carlisle, Signaller, 20th Battalion, of Katoomba, NSW; 3310 Austin William Edwards, of Gloucester, NSW. 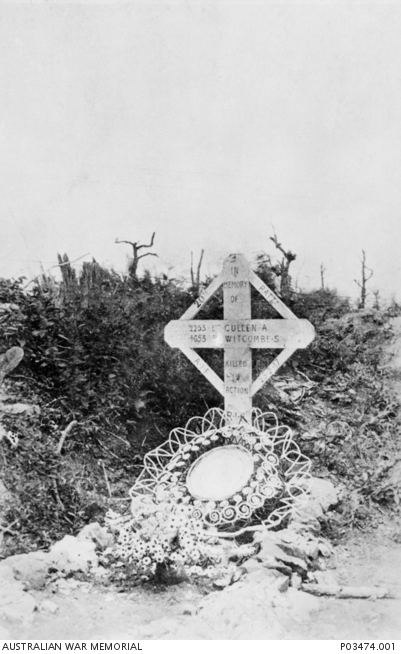 L/Cpl Cullen was killed in action on 25 February 1917 and is buried at Warlencourt, France. (Original stored in Archive Store).